Recap of Triple H breaking Reigns’ nose last week on RAW. Triple H says everyone is afraid of authority. He says the fear is good and natural. It let’s you know your place in life. Reigns should have known his place, but he didn’t, so now he’s sitting at home breathing through his mouth. Dean Ambrose comes out to the ring. Ambrose says Reigns told him to tell Triple H that he’s coming for him. Triple H talks about Ambrose and Reign’s bromance and references the Oscars. Ambrose makes some movie-related jokes. Eventually he gets to the point. Ambrose asks Triple H who he did not want to win at Fastlane. Triple H says his question is irrelevant. He says it doesn’t matter because Ambrose was never a factor in the match. Ambrose gets in Triple H’s face. Triple H calls him crazy. Ambrose says Triple H is smart, smart enough to know he can’t beat Ambrose. Ambrose challenges Triple H for the title right now. Triple H says it doesn’t work that way, but he’ll think about. He’ll give him an answer before the end of RAW. But in the meantime, Ambrose will face Alberto Del Rio. Very good match. They opened with a nice series of pinning combinations and attempts at their finishing holds, then gradually built up to a faster pace. They both looked like they were trying to prove a point by having a very competitive match, and they did. The finish was pretty well done for the outcome they needed. Bray Wyatt gives the definition of insanity. He might be insane, bit his mind might actually be the key to saving the entire world. He knows what he must do. Join him and receive eternal paradise. Defy him and you will be conquered like all the rest. It was a quick match meant to prove a point more than anything else. Not much to it. I like the outcome though, it keeps things interesting and doesn’t bury anyone. I think Miz really benefited from getting beat up by Styles and Jericho recently. He held his own and looked more serious, which is good. I’m still not a huge fan of his currently, but I’m liking him more now. Recap of Shane McMahon returning to RAW. 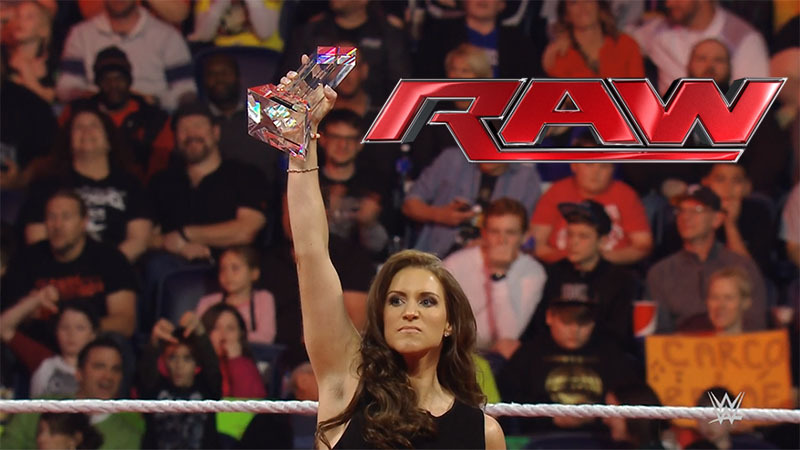 Stephanie McMahon comes out to finish her acceptance speech for her award Vince gave her last week. The crowd chants for Shane and Stephanie gets upset. She makes some good points about Shane being absent from the business and the McMahon family for the last seven years. She loves Shane, but she doesn’t respect him because he always stabs her in the back. He’s jealous of her. He won’t take over RAW because The Undertaker will dismember him. Eventually everyone one will have to bow down to The Authority. The King. And the Queen. Good match, pretty even. A pretty straightforward Lucha Dragons/League of Nations bout. Not a lot to say about it really. Renee Young asks Natalya how she always looks so good. She sleeps, exercises, drinks water, and eats Subway. It’s a commercial. For Subway. Pretty good match. Ryback made it a point to act especially vicious by mounting Rose and repeatedly pounding him in the head even when the ref tried to pull him off. I like the change. At least he has a character now. I’m less thrilled with how they’ve been using the Social Outcasts lately. Replay of Lesnar attacking Ambrose in a parking lot last week and Ambrose’s return in a stolen ambulance. New Day explains that they are successful because they are a brotherhood. They then hug. They are the best three-man unit in history. They list some great teams that they are better than, like Sonic & Tails, Snoop & Dre, and Edge & Christian. Y2AJ are just pretending to be friends. Good match. Styles was in trouble for most of it, then Jericho came in during the breakdown. Very solid match from both teams. Styles tells New Day that Y2AJ is now at the top of the list for the tag titles. Jericho challenges New Day to a title match for RAW next week. Vince McMahon says only fools believe in miracles. He loves Shane, enough to teach him a lesson he will never forget. A lesson taught by his instrument of destruction, The Undertaker. The Undertaker comes out and Vince repeats that he is “his” instrument of destruction. Taker grabs him by the throat. The Undertaker tells Vince that his son’s blood will be on Vince’s hands, not The Undertaker’s. Taker leaves the ring. After collecting himself, Vince says the reality is that he will be standing in the ring the night after Wrestlemani, saying that Shane has failed in his match, failed as as a son, and has lost his inheritance. He will renounce Shane as his son. Not a bad match. It was similar to the match D-Von and Jimmy had on Smackdown, but there was a little more to this one. I liked it, and the distraction from D-Von was better than Bubba’s on Smackdown. R-Truth tells Goldust that the nonsense about them tagging has gone on too long. It’s not happening. They’re done. Goldust walks away sad. R-Truth thinks about it. Okay match. It became a contest to see who would win by countout. It made sense, especially the ending, but sense doesn’t always make for an entertaining match. It was fine. Renee Young asks Brie Bella about coming back tonight. She says she has nothing to be ashamed of and feels good. Lana walks up an insults Brie, mostly saying that Rusev is better than Daniel Bryan. Pretty good match. Naomi pretty much dominated, even without the help of Tamina. I don’t really like that Naomi still seemed to be a second-thought even though she dominated the match. The Freebirds are the newest inductees in the WWE Hall of Fame. Becky Lynch and Sasha Banks talk about their draw. Charlotte informs them that they will have another number one contender match on Smackdown. Pretty good match. It was kind of just a beating for a good part of the match. Ambrose went into the match still hurt from the beatings he’s taken from Lesnar. Del Rio pretty much had his way with Ambrose, but Ambrose hung in there and started a comeback. That’s his thing now, and he does it well. After the match, the League of Nations continues their attack. The leave Ambrose for Triple H. Triple H talks to Ambrose, and Ambrose attacks. It’s a short attack though. Triple H quickly Pedigrees Ambrose. He then accepts Ambrose’s challenge for a title match and walks away. Ambrose crawls to a mic and says, “thanks.” Triple H goes back and beats Ambrose on the announce table. I liked the show. Lots of matches which were mostly okay but did have a few good, and the main story for the night between Ambrose and Triple H was entertaining. Also, It’s an interesting development and a good way to keep their characters and stories at the forefront since Reigns and Lesnar apparently won’t be here every week (though Reigns is hurt so I get it). Even with the ending (or maybe regardless of it) this was a very good match. It was the most competitive and the most intriguing for me.